The year was 1986. Ronald Reagan was in his 2nd term, a first class stamp was 22 cents, we were all mourning the loss of the Challenger and her crew, Chernobyl had been evacuated and 100s were dead or dying, and the Supreme Court was reaffirming abortion rights. The Chicago Bears were Super Bowl Champions and the N.Y. Mets were on their way to a World Series Championship. Steve Winwood and Paul Simon were winning Grammy's, Dionne and Friends were at the top of charts with That's What Friends Are For and Fox was becoming the fourth television network. L.A. Law, Moonlighting, Cagney and Lacey, Cheers, and Magnum P.I. were big hits on television, while on the big screen Platoon won the Oscar for Best Picture. And, I was entering my first ever Frisbee Dog competition. In mid 1985 I had decided that I wanted a dog and stumbled across a book by Karen Pryor, How to Teach Your Dog to Play Frisbee. This book (out of print) was an outstanding training manual and mentioned a number of breeeds that excelled in the sport. The book also offered a mailing address to the Ashley Whippet Invitational along with the phone number to a place to buy Frisbees. Up to this point my only exposure to Frisbee dogs was in the mid to late 70's with a family pet named Rusty. Rusty was a very cool little Cattle Dog that loved the Frisbee. But at the time it never occurred to me that there might be such a thing as Frisbee Dog Competition. Well, finally in November of 1985 I found a cute little Border Collie puppy. Together Flash and I started down an amazing path that has filled my life with a wealth of wonderful moments, memories, and enduring friendships. In 1986 no one showed up at the competitions I attended with tents for shade, kennels for their dogs or ice chests full of sport drinks or store bought bottled water. In those days if you were hot you usually had to look around for a shade tree to camp under, and if you were thirsty there always seemed to be someone around with a healthy and sometimes unhealthy supply of cold beer. I don? ?t remember anyone using a van for dog and equipment transport and of course at that time no one knew what an SUV was. For a number of years I could have gotten to any competition I entered in a two seat sports car. Also in 1986 no one owned or needed a vaulting vest. The AWI community throw and catch competitions took place on a 17 yard circle and the maximum distance in the regional mini-distance event was 30 yards. There was interesting admonition in this year's guidelines that stated - Male dogs should compete first to avoid distractions. The Regional competitions were four round events with semifinals occurring at a local park and the finals taking place as a pre-game activity at a professional baseball or football game. In 1986 the World Championship Finals took place prior to the Washington Redskins game at RFK Stadium in Washington, D.C. The preliminary rounds occurred earlier in the day on the grounds of the Smithsonian Mall. The judging criteria has changed over the years. A demonstrated ability by the dog/owner to perform crowd-pleasing, unique, novel or even trend setting aerobatics, (starting or ending with disc in flight), requiring a high degree of ingenuity, teamwork and precision timing. Throws by the owner in a manner ideally suited to showcases the dog's ability to make exciting and even spectacular mid-air catches vertically and horizontally, with a degree of consistency, style and grace. A demonstrated ability by the owner to challenge the dog with throws that have different spins and angles, at varied distance, skip flights off the ground, as well as throws where dog does not have eye contact before release, but is consistently at the right place at the right time to make the catch. At this time the AWI had seven Regional Finals. They included the Mid-Central, Mid-Atlantic, Far West, Southwest, Midwest, North Central, and the Southeast. Any thrower/dog team which previously competed at World Finals will start Round 3 minus 1 point. If a former World Finalist competes with a new dog at Regional Finals, the team will start Round 3 minus 1 point. Any previous World Finalist team will start minus 1/2 Point for each year competed. Any previous World Finalist thrower with a new dog will start minus 1/2 point for each year competed. Any previous World Champion team starts minus an additional 1 Point. During the World Finals, judges may, at their discretion, award a maximum of Two Bonus Points for the contestant(s) with the most spectacular Leaping Ability. This was also the year that Ron Ellis came up with the original and truly unique idea of starting a local club comprised of people who enjoyed playing Frisbee with their dogs. A club where anyone and everyone could come together with their dogs for the camaraderie and chance to share, learn and grow. A wonderful and distinctive idea that has transformed our sport. In 1988 the Ashley Whippet Guidelines replaced Leaping Ability with Agility and the categories had simply become Showmanship and Agility and Difficulty and Execution. Scoring was still based on 10 points per category with 40 points possible. The maximum number of Points deducted for being a previous World Champion or World Finalist will be 3?? points. During World Finals, judges may, at their discretion, award up to Two Bonus Points for the dog with the most spectacular performance in Freeflight rounds; and make a similar award for the most innovative Freeflight routine. Order of finish for 1st, 2nd and 3rd place in each category may, at judges option, earn bonus points for World Finalist. The World Finals were held at Walt Disney World in Florida. Also by 1988 the there had become only six regional qualifier events rather than the seven in place in 1986, and the stadium finals had become a post-finals exhibition with the Regional Champion and Runner-up being invited to perform with the Cycle Celebrity Team. Also, by this year everyone seemed to have discovered the vault and numerous variations and styles were sweeping the country. The Vault: It is still debated who first conceived, envisioned, and executed the first true vault. But my money would have to be on Ron Ellis. The Statue of Liberty move (a modified leg vault to a take as well as an over the back or off the back take) had been around for a number of years and variations were used in competition by Bill Murphy, Pepper Nichols, Peter Bloeme, and others. 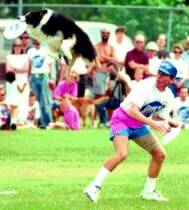 Then a grainy photograph was published a 1986 or 1987 issue of the K-9 Disc Master newsletter of Ron Ellis, with his dog Maggie doing a true back vault. In late '86 or early '87 I was at the park with Ron and Maggie and as Ron explained his idea for this new trick I stood there and told him that even if it worked the timing would be impossible. We had both been doing over the back takes, but this idea was radical. I stood and watched in amazement as the back vault was born. 1989 found the sport without an official sponsor, but thanks to Irv Lander? ?s tireless efforts and financial contributions the AWI had a successful year capped off with a World Finals held at the State Fair of Texas. This was also the year that Jeff Perry and his awesome dog Gilbert put on spectacular and vaultless routine and in the process put a big exclamation point on the false belief that vaulting was now a necessary component of any World Championship team. By the time 1990 rolled around the equal opportunity/compensatory system had been dropped from the AWI Guidelines as well as the Post-Finals stadium exhibition. There was also a new sponsor onboard – Come ? ?N Get It had stepped in as the official AWI sponsor. The official AWI sponsor had become Friskies Come 'N Get It. The Regional Mini-Distance field was lengthened to 40 yards and for the first time we found a word of caution in the AWI Guidelines regarding the use of vaults. The 17 yard circle used in community events had been eliminated in favor of a rectangular field. As the sport matured so did the judging criteria. The following is the judging guidelines from 1992. A demonstrated ability by dog and thrower to effectively perform attempted throws/catches of a non-routine nature with consistency. This includes high-risk maneuvers, throws with varied spins, and catches where dog does not have eye contact with thrower and still succeeds; even where second or third effort is required. Consistent, smooth completion of maneuvers in routine which emphasizes teamwork in the progression of throws and catches; particularly where they are of a non-routine nature. The judges look for quality here, not necessarily the number of catches made or not made. A consistency of throws and catches, with the disc in-flight, that showcase the dog? ?s style and grace in motion. Note: The use of vaults, while highly entertaining and often spectacular, should be tempered with consideration for the animal? ?s welfare. Excessive heights, or frequent repetitions of vaults, which employ the thrower? ?s body as a launching pad, will not increase the possibility of a higher score. Bonus Points: Judges may at their discretion award up to 2 Bonus Points to the contestants with spectacular leaping agility or innovative freeflight moves. Also in 1992 we found a 360 degree change in philosophy. Instead of penalizing previous World Finalists and World Champions with the former compensatory system we now found a policy that gave current World Finalists an automatic berth into the 2nd and 3rd rounds of the Regional Finals. The current World Finalists still had to go out and do a routine in the first round, but regardless of their effort or performance they were still able to compete head-to-head in the final two rounds. Novices (defined as teams, thrower and dog, who have not competed in a Regional event before) will be allowed 60 seconds to perform Freeflight while teams with previous Regional experience will be allowed 90 seconds. All competitors have an equal chance to make the final rounds as teams are scored on what they do in the time provided, not on the amount of time used. In this, my eighth year of competition I finally showed up at a Regional competition with my routine on paper and memorized, and finally qualified for my first World Finals. By 1993 the 60 second novice rule had disappeared from the AWI Guidelines. The official sponsor had gone from Friskies Come 'N Get It to simply Friskies. We also saw the wording under Degree of Difficulty clarified. Instead of high-risk maneuvers the wording changed to challenging maneuvers. This was also the first and only year that we saw an interesting twist to the challenge of qualifying for the World Finals. There was a drawing comprised of the names of each 3rd place finisher from the each regional competition for two added spots at that year's World Finals. We saw an exciting change this year – the addition of an Open Final. For 1994 we have added an Open Final. Any competitor, who has not already won a trip to the 1994 World Finals, will be allowed to compete in the Open Final. Suddenly, we all had a very strong incentive to continue our workouts throughout the summer and as a result it seemed that more than a few teams went from just good to very good. This event brought teams together from across the country and gave some truly talented teams a dose of national exposure that had previously only been found at the World Finals. Also from the 1994 AWI Guidelines we saw a 50 team limit or 10:30 a.m. registration cutoff, whichever occurred first.
. . . particularly where they are of a non-routine nature. The judges look for quality here, not necessarily the number of catches made or not made. Our catch to miss ratio had always had some impact on our scores, but suddenly we could no longer fall back on the subjective criteria of a non-routine nature and quality. In essence, at this point if you wanted a trick to count, you had better execute and make the catch. By 1996 more changes were in store for AWI with a sponsor name change from simply Friskies to Friskies ALPO or to most simply ALPO. Only tricks or moves that begin or end with disc in flight are judged. In other words, the disc must be in the air at some point in order for the move to be scored. Tricks where the disc is handed off to the dog will not be counted. The admonition on vaults had also moved out of the Leaping Agility category and was now simply placed at the end of the four judging categories. In 1996 we heard rumblings of something called the QUADRUPED. The first QUADRUPED event was a one-heat performance for the Jacksonville Jaguars in April. The QUADRUPED was offically up and running. The first open competition took place in April where Don Dearing & PERTH edged out Chuck Hensley & RASCAL for the win. Melissa Heeter became first female trainer to win the World Championship Title and again disproved the notion that vaults were a necessary element in a World Champions routine. Late that year we started hearing from Greg Tresan about the possible formation of the International Disc Dog Handlers Association (IDDHA). Irv Lander passed away on May 29th after a short illness. This man had more influence in our sport than any other single individual probably ever will and his passing left a void not only in our sport, but also in many, many lives. Anyone who has ever enjoyed watching or competing in a disc competition owes Irv a large measure of gratitude. A personal memory of Irv: Irv's kindness was legendary and it first touched me back in 1989. That year I missed the World Finals by half a point. There were no second chance Open's to look forward to and I'm sure the disappointments of the day's events were heavily etched across my face. Irv either saw or sensed this disappointment. Who knows maybe, through the empathy that helped save many a dog's life, he felt my sadness and disappointment. What ever the case may be, he truly touched me that day when he invited Flash and I to perform later that evening along with Alex Stein, Peter Bloeme and the first and second place finishers at half time of the Dallas Cowboy game. I'll always cherish the memories of that evening. Thanks again Irv. The ALPO/AWI went from a single Open Regional Finals to East and West Open Regionals and we saw the World Finals swell to 16 competitors. The IDDHA became a reality and offered for the first time in the history of our sport a way to test, title and rank disc dogs. Also in 1998 Lou McCammon became involved with Purina Dog Food and we saw the birth of the highly entertaining, made for TV event known as the Incredible Dog Challenge . The Challenge showcases the best-of-the-best in a number of dog sports which includes the high powered Freestyle Flying Disc competition. Disc dog competitors have two and a half minutes to showcase both themselves and their dogs in the most creative, most energetic, and the most entertaining routines possible with the handlers choice of using an unlimited number of discs. It started out as an Invite Only due to time restraints and the number of different events, but in 2002 the IDC added a Qualifier Day to give some of the locals a chance to qualify to compete head-to-head against the "Big Dogs" in Saturday's TV Round. The Challenge was also probably the first to hold contests in the snow. The IDC comprises 3-4 regional events a year in various cities with a National Finals held at the Purina Farms the first week of Oct.
Peter Bloeme established the PAWS Freestyle scoring system. Pre-Registration was required for the first time at Regional events. The Sport Division was introduced that gave contestants a separate Distance/Accuracy only division. This also reintroduced competitors with the wonderful option to compete with a 2nd dog at Regional events. Bob Evans became first competitor to win a World Championship Title with two separate dogs. After many years of support Friskies ALPO bowed out as national sponsor at the conclusion of the 2000 season. Also, in 2000, The QUAD became the disc dog world's first national point series competition with The QUADRUPED Series. In August 2000 Chris Sexton & LAIKA were crowned the Men's Champion, and Janice Hensley & RIKER became the Women's Champion. In December the United Stated Disc Dog Nationals announced the formation of a steering committee dedicated to organizing the annual Nationals Championship Series that would be commencing in 2002. The US Disc Dog Nationals promised to be an exciting contest in which any team could compete regardless of their Club membership status or political affiliation within the sport. With the loss of a national sponsor Peter Bloeme established the Skyhoundz Championship in the proud tradition of the Ashley Whippet Invitational and continued with Local, Regional and World Championship competitions. 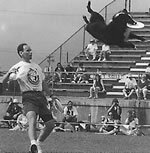 The Unified Frisbee Dog Organization (UFO) was established as an organization committed to running high quality, competitor friendly Frisbee dog contests. They held five major tournaments and many more local and international tournaments that culminated in the crowning of a World Cup Champion and a World Cup Club. The IDDHA held their World Championships over the course of three days with a total cash purse of $5,600. The USDDN start holding sanctioned competitions. For the first time we saw international eligibility at Regional Finals and there were plans to bring international competitors to the World Finals. Terrorist attacks almost derailed the World Finals this year. The World Finals were cancelled in Washington D.C. and World Finalists coming in from Japan were sent back home. With great effort and expense Skyhoundz was able reschedule and move the World Finals to Atlanta, GA. and even though the Japanese could not return Skyhoundz hosted a national contingent of competitors. We also saw the introduction and use of the all new K10 Disc at the Skyhoundz World Finals. This may have been the busiest and most exciting year in the history of our sport. The USDDN (US Disc Dog Nationals), the UFO (Unified Frisbee Dog Operations), FDDO (Flying Disc Dog Open), Purina IDC (Incredible Dog Challenge), and Skyhoundz were all in full swing, which meant many competitors may have competed with both Fastback Frisbees and K-10 discs and could have possibly competed under five different judging criteria with time limits ranging from 90 seconds to 150 seconds, and disc limits from 5 to 7 to 10 to unlimited. Even more disc dogs clubs were being organized and there were regionally and nationally organized events occurring across the country. There were numerous State Champions and we had three National Champions with the USDDN, FDDO and IDC all crowning separate and different Champions under three different judging criteria. The UFO crowned a World Cup Champion. Skyhoundz hosted the first ever truly international field of competitors composed of both Japanese and Americans competitors and crowned a World Champion in both freestyle and distance/accuracy divisions. In addition, the UFO and FDDO awarded Club Championships. 1986 seems like a lifetime ago. Our sport has grown, matured, and flourished in ways I could not have conceived when I started. Judging criteria has and continues to change and evolve. In 1986 I went to two or three local competitions and one regional event. The only competitors that traveled any great distances were on their way to the World Finals. I never dreamed I would be headed to competitions in places like Los Angeles, CA, St. Louis, MO, Jacksonville, FL, Louisville, KY, Birmingham, AL, St. Petersburg, FL, Washington, DC, or Atlanta, GA. It was rare in those early years in the sport to see competitors with more than one dog. It seemed that many of the established teams just kind of dropped out of the sport when their dog got to old to compete. Also in 1986 that I had my first exposure to a couple of World Class routines. I don't remember how many throws, catches or misses Bill Murphy and Pepper Nichols had, but I do remember as if it were yesterday, a jaw dropping sense of wonderment and amazement. Bill with his World Champion Bouncin' Boo and Pepper Nichols with his World Finalist Chino were simply astonishing and from time to time I still draw inspiration from the sense of amazement I felt on that day and now each time I take the field I try to remember that I to may be influencing someone just starting out in the sport. I wait with eager anticipation at what my next 17 years in this sport will bring, but I think certain aspects of our sport will remain intrinsically and forever unchanged. Give me a dog, a disc and some open space and the sheer joy and excitement that first captured my spirit so long ago comes flooding back to me. Take away the disc dog clubs, take away the organizations and their competitions, take away the titles, take it all away and you will still find me throwing a disc to my dogs. The clubs and competitions have pushed me to work hard to excel and remain competitive, they have also brought a host of treasured friends, valued relationships, and enough cherished memories to last a lifetime. But, as valued as all of that is it will never replace what has kept me in this sport for so long - the effortless, almost childlike joy from playing a game of throw and catch with my dogs. So while looking ahead with eager anticipation I also look back and can see an activity that for me will continue to transcend all change. An activity built on the foundations of passion and excitement punctuated by a wonderful kaleidoscope of uncomplicated joys and simple delights. An activity built on a foundation of trust and faith between me and my dogs involving a simple piece of plastic. And, maybe most importantly, an activity where the tricks I teach my dogs are in the end far less important than the lessons of friendship, faith and fidelity that they teach me.